01B54 Electric Lifting Counterbalanced Crane is a counterbalanced workshop crane (built-in ballast weights) with a 360° pivoting arm, suitable for handling industrial equipment up to 500 kg in line with Safety international standards. The crane is fitted with a pendant control station for electric lifting and lowering of the jib, and an emergency button. It comes with a traction battery and battery charger. 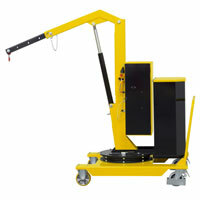 Easy to move, thanks to its high capacity pivoting wheels fitted with foot brakes. It has a compact structure (frontal size 995 mm) so it can be easily manoeuvred into position on congested sites and narrow lanes. Jib is extendible in 4 positions.